View More In Inflatable Yard Decorations - Page 2. 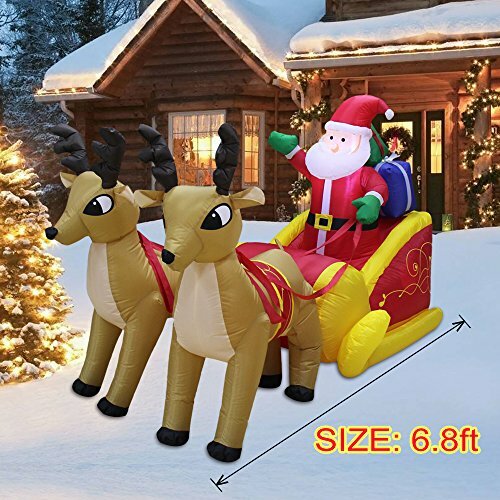 Features: - Self-inflating blower with self-inflating design, durable weatherproof nylon included in just a few minutes - Just insert this decoration, it inflates and lightens in minutes! This inflatable will be present in front of your family or lover in seconds. This is the perfect decoration in your front door or in the backyard at night. Worried about storage? Just let the air out, fold it! Caution: Do not inflate when storms or strong winds. Protect the fan and power cord from water damage. Does not apply to 14 degrees Fahrenheit (or -10 degrees Celsius) below the temperature. Not suitable for children under 3 years of age. Built-in white LED lights, light gently in the soft ambient light at night. If you have any questions about this product by VOCOO, contact us by completing and submitting the form below. If you are looking for a specif part number, please include it with your message. Home Accents Christmas Decoration Animated Inflatable Kaleidoscope Dragon with Santa Hat 12 ft.